The British West Indies, sometimes abbreviated to the BWI, is a collective term for the British territories in the Caribbean: Anguilla, Bermuda, the Cayman Islands, Turks and Caicos Islands, Montserrat, the British Virgin Islands, The Bahamas, Barbados, Belize (formerly British Honduras), Antigua and Barbuda, Dominica, Saint Kitts and Nevis , Grenada, Saint Lucia, Saint Vincent and the Grenadines, Guyana (formerly British Guiana), Jamaica (formerly Colony of Jamaica), and Trinidad and Tobago. Before the decolonization period in the later 1950's and 1960's it included all British colonies in the region, together with two mainland colonies, as part of the British Empire. In 1912, the British West Indies were divided into different colonies: The Bahamas, Barbados, Guiana, British Honduras, Jamaica (with its dependencies the Turks and Caicos Islands and the Cayman Islands), Trinidad and Tobago, the Windward Islands, and the Leeward Islands. Between 1958 and 1962, all of the island territories except the British Virgin Islands and the Bahamas were organised into the West Indies Federation, which did not include the mainland colonies of British Honduras and British Guiana. It was hoped that the Federation would become independent as a single nation, but it had limited powers, many practical problems, and a lack of popular support. Consequently, the West Indies Federation was dissolved in 1962. Sir William Stapleton established the first federation in the British West Indies in 1674. He set up a General Assembly of the Leeward Islands in St. Kitts. Stapleton's Federation was active between 1674 and 1685, during his term as governor, and the General Assembly met regularly until 1711. By the 18th century, each island had kept its own Assembly and made its own laws. The islands continued to share one Governor and one Attorney-General. Although unpopular, Stapleton's Federation was never really dissolved but simply replaced by other arrangements. Between 1816 and 1833, the Leewards were divided into two groups: St. Christopher-Nevis-Anguilla and Antigua-Barbuda-Montserrat, each with its own Governor. In 1833 all the Leeward Islands were brought together, and Dominica was added, remaining as part of the group until 1940. In 1869, Governor Benjamin Pine was assigned to organise a federation of Antigua-Barbuda, Dominica, Montserrat, Nevis, St. Kitts, Anguilla and the British Virgin Islands. St. Kitts and Nevis opposed sharing their government funds with Antigua and Montserrat, which were bankrupt. Governor Pine told the Colonial Office that the scheme had failed due to "local prejudice and self-interest". His only achievement was to give the Leewards a single Governor. All laws and ordinances, however, had to be approved by each island council. In 1871 the British government passed the Leeward Islands Act, by which all the islands were under one Governor and one set of laws. The Federal Colony was composed of all islands organised under Governor Pine's previous attempt. Each island was called a "Presidency" under its own Administrator or Commissioner. Like earlier groupings, this federation was unpopular but it continued until 1956, when it was redefined as the Territory of the Leeward Islands. In 1958 the Federation of the West Indies was organised, of which the Leeward Islands became a part. In 1833 the Windward Islands became a formal union called the Windward Islands Colony. 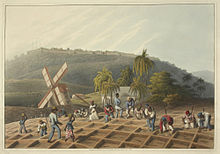 In 1838, Trinidad (acquired in 1802) and St. Lucia (acquired in 1814) were brought into the Windward Islands Colony, but were not given their own assemblies (having previously been Crown Colonies). In 1840 Trinidad left the Colony. The Windward Islands Colony was unpopular: Barbados wished to retain its separate identity and ancient institutions, and the other colonies did not want to associate with it. (They needed the association until 1815 for defence against the threat of French invasions during the Napoleonic Wars.) The individual islands resisted British attempts at closer union. Barbados in particular fought to retain its own Assembly and left the union in 1884. Power for the union was then transferred to Grenada as overseer of the bloc. From 1885 to 1958, the Windward Islands Colony included Grenada and the Grenadines, St. Vincent and St. Lucia during the entire period. Tobago left in 1889, forming a union with Trinidad. Dominica joined the Windward Islands Colony in 1940, after having been transferred from the Leewards, and remained in the Colony until 1958. After 1885 the Windward Islands Colony was under one Governor-General in Grenada, and each island had its own Lieutenant-Governor and its own assembly (as before). Attempts to create a Federal Colony, as in the Leewards, were always resisted. The Windward Islands Colony broke up in 1958 when each island chose to join the new Federation of the West Indies as a separate unit. The Cayman Islands and Turks and Caicos Islands were grouped under Jamaica out of convenience and sometimes for historical and/or geographical reasons. British Honduras (later Belize) was surrounded by hostile Spanish colonies and needed the protection afforded by the Jamaican Army and Navy. In addition, British Honduras had been founded by loggers. It increased in population partly by the settlement of Englishmen migrating from Jamaica in the late 17th and early 18th centuries (settlers also immigrated directly from England; others were born in the colony.) From 1742, British Honduras was a dependency directly under the Governor of Jamaica. In 1749 the Governors of Jamaica appointed Administrators for British Honduras. In 1862 British Honduras became a Crown Colony; it was placed under the Governor of Jamaica with its own Lieutenant-Governor. In 1884 it finally broke all administrative ties with Jamaica, as did Cayman Islands and the Turks and Caicos Islands. The West Indies Federation was a short-lived federation that existed from 3 January 1958 to 31 May 1962. It consisted of several Caribbean colonies of the United Kingdom. The Federation's purpose was to create a political unit that would become independent from Britain as a single state, similar to the Federation of Australia or Canadian Confederation. However, the Federation collapsed due to internal political conflicts before that could develop. In 1967, following the termination of the West Indies Federation, a number of Eastern Caribbean islands formed a free association form of government along with the United Kingdom called the West Indies Associated States. The arrangement was created through the British House of Commons passing the Associated Statehood Act (1967). As part of the arrangement more sovereignty was granted to the bloc of West Indies countries with the United Kingdom maintaining responsibility for defence and external affairs only. Cricket has traditionally been the main sport in the British West Indies (though others sports such as football and basketball have challenged its dominance since the 1990s). Most of the countries and territories listed above field a combined cricket team called the West Indies, which is one of the ten elite international teams that play at Test match level. The West Indies hosted the 2007 Cricket World Cup of ODI Cricket and the 2010 ICC World Twenty20. ^ Location and Facilities. Stmatthews.edu (30 May 2013). Archived 31 May 2012 at the Wayback Machine. Retrieved on 17 July 2013. ^ a b The British West Indies: Their History, Resources and Progress – Sir Algernon Edward Aspinall – Google Boeken. Books.google.com (12 August 2008). Retrieved on 17 July 2013. ^ Government of the West Indies – Hume Wrong – Google Boeken. Books.google.com. Retrieved on 17 July 2013. ^ Sawyer, Caroline (2009). "Country report: united Kingdom" (PDF). Robert Schuman Centre for Advanced Studies. European University Institute. 1.1 Ambiguity of terminology of rights: The scope of British nationality has shrunk from including everyone born in a vast empire at the end of the nineteenth century to excluding even some people born in the territory of the UK itself. The term ‘British nationality’ is still legally meaningful, but only the sub-category of ‘British citizen’ necessarily entails the right to enter the UK. ^ Hogan, Claude E. S. (14 February 2003). "Seeking Refuge in the Mother Country: UK Maintained Strict Exclusion Policy Despite Erupting Volcano". Before the 1905 Aliens Act, which was consequent to the Report of the Royal Commission on Alien Immigration in 1903, the principle of 'ius soli' was important because a Montserratian by reason of birth within the British empire would have enjoyed not only freedom of movement to the UK but also what we now call the 'right of abode in the UK'. The Aliens Act of 1905 was part one in the statutory creation of the alien as an expanding category of people. Bearing on the usual socio-economic and public policy concerns of health, maintenance and accommodation, the Act defined the alien by certain characteristics. Mawby, Spencer. Ordering Independence: The End of Empire in the Anglophone Caribbean, 1947-69 (Springer, 2012). Research Institute for the Study of Man. "British West Indies". New York University Libraries.